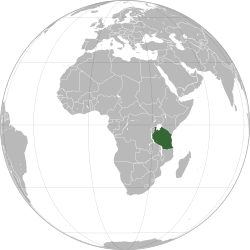 Tanganyika /ˌtæŋɡənˈjiːkə/ wis a sovereign state frae 1961 tae 1964. It wis situatit atween the Indian Ocean an the African Great Lochs o Loch Victoria, Loch Nyasa an Loch Tanganyika. This page wis last eeditit on 6 Februar 2019, at 20:59.